The Amish Hampton Single Pedestal Table is a heavy duty hardwood pedestal that will provide immense stability and durability for generations. The Hampton Table features a solid 1" thick hardwood table top and carries up to three 12" extensions with double equalizer slides. 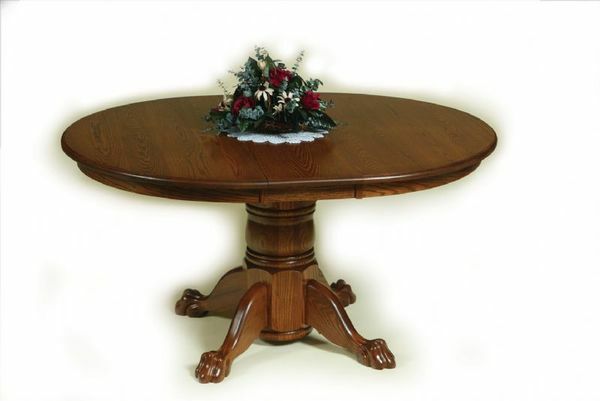 The Hampton Single Pedestal Table is completely handcrafted and made in America's heartland. If you have questions on this table or would to order with one of our sales associates, please call or visit our store in Florida. Valerie, I just wanted to let you know the table arrived safely Saturday and looks lovely. It's exactly what I needed for my dining area. Thanks very much for all your help along the way.